GMOs and Endo – Just Say NO! It’s election night in the United States and there is one pertinent issue I am keeping my eye on – Proposition 37 in California, which requires food manufacturers to label their products if they contain GMOs. It’s passing could spur like movements across the United States and be a key in having this requirement become a federal mandate. GMOs are Genetically Modified Organisms – basically seeds that have been genetically engineered to resist pests and herbicides. 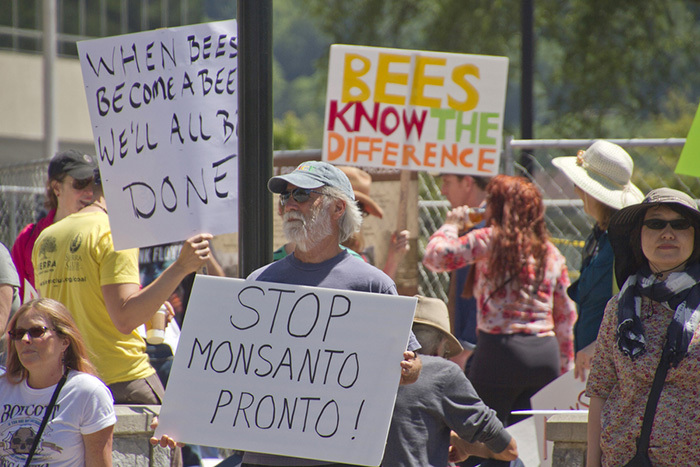 The biggest player in the GMO game is (evil) chemical company, Monsanto. I first heard about Monsanto in the awesome documentary Food Inc. This movie literally changed my views on the food industry in the United States. I (like my boss) was unfamiliar with GMOs, their effects or the amounts of them that I was eating on a daily basis. The crops most likely to be GMO in the United States include alfalfa, corn (canola), cotton, soy, papaya, sugar beets, zucchini and yellow summer squash. Proponents of GMOs claim that they are necessary to feed the world and Monsanto continues to claim that there are no dangers associated with consuming GMOs, even though lab studies continue to prove otherwise. The consumption of GMOs cause overly negative effects on the health of the immune system. Those who consume GMOs regularly are more likely to get sick. GMOs have also been linked to fertility issues as regular consumption leads to a harder time getting and staying pregnant. In one study done in Europe rats who were feed GMO food gave birth to babies who died within weeks of birth. In addition, another study animals feed Monsanto’s GMO corn showed liver and kidney damage within three months. More bad news for endometriosis, as these organs are responsible for the filtering of toxins from our bodies. All of this is bad news for endo gals, especially those of us trying to fall pregnant. Things are already hard enough without added chemicals disrupting things further. Educate others about the effects of GMOs. Most people are unaware of this issue. Knowledge is power and true change comes from grassroots movements like that in California. Proposition 37 would be the first labeling requirement to pass in the United States. All other countries (except Canada) require GMO labeling or have banned GMO production. If California passes this they could lead the rest of the country to do the same. We have a right to know what is in our food. Proposition 37 started with the help of a lot of concerned citizens who believe in this fact. My favorite Dr. Bronner’s is a huge proponent for Prop 37 – increasing my love for their products 🙂 Seeing who is investing in the law’s passing and who is investing in it’s defeat in turn tells the world that they are using GMOs in their products – a public labeling of sorts.